Encore Evans Station will be a thoughtfully designed luxury apartment community within walking distance from Denver’s burgeoning South Broadway district and the Evans Light Rail Station. (Dallas, Texas) February 24, 2017 – Encore Multi-Family, LLC, a subsidiary of Dallas-based Encore Enterprises, Inc., has officially broken ground on Encore Evans Station located at the northwest corner of Jewell Avenue and S. Bannock Street, approximately two blocks north of Evans light rail stop. The 224-unit multi-family community will feature an industrial contemporary design in a high density garden layout that allows for individual parking garages and site amenities of size and scale often found in more suburban communities. Amenities will include a large pool and spa area with grilling, outdoor lounge, and fire pit; lushly landscaped open space and courtyards; bocce ball court; large dog park; and pedestrian and bike plaza as a linkage to the future Jewell Street Pedestrian Bridge. Residents will enjoy a luxurious clubroom directly linked to the pool area for indoor/outdoor entertaining, business center and private conference room, and the fitness center complete with a designated free weight room and flex yoga/spin studio. Other amenities include a centrally located bike repair shop and storage, indoor dog wash, and 24-hour package concierge for 24-7 resident retrieval of packages. Encore Evans Station will offer a variety of one and two-bedroom units designed to provide variability in pricing to the market. All units are professionally designed and will have the latest finishes including stainless steel appliances, energy efficient LED lighting fixtures, and individual full size washer/dryers. 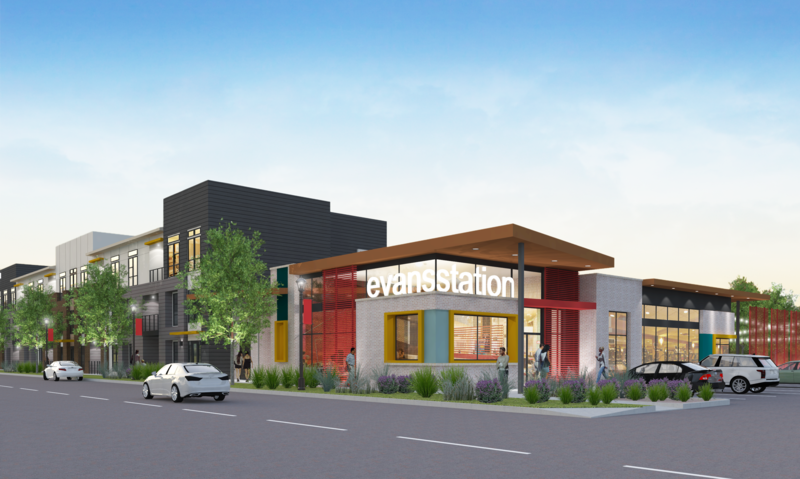 “Encore Evans Station provides us with an opportunity to continue to redevelop one of the larger sites located in the South Broadway corridor, walking distance to the Evans Station light rail station. This will enable us to provide unique suburban amenities in an urban environment,” said Bradley Miller, President of Encore Multi-Family. Construction for Encore Evans Station is currently under way with first units to be available for occupancy First Quarter 2018.